12 ton capacity in grapple with telescope in. 9 ton capacity in grapple telecope out. This TMF 12/9 have grapple area from 3,75m² - 4,15m². Normally used by sawmill and smaller pulp and paper mills. Grapple with endless rotating and open or closed grapplesides. 15 ton capacity in grapple with telescope in. 11 ton capacity in grapple telecope out. This TMF 15/11 have grapple area from 4,8m² - 5,7m². Normally used by sawmill and smaller pulp and paper mills. Grapple with endless rotating and open or closed grapplesides. 25 ton capacity in grapple with telescope in. 18 ton capacity in grapple telecope out. This TMF 25/18 have grapple area from 6,0m² - 7,8m². 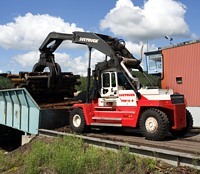 Normally used by bigger sawmills and pulp and paper mills. Grapple with endless rotating and open or closed grapplesides. 28 ton capacity in grapple with telescope in. 21 ton capacity in grapple telecope out. This TMF 28/21 have grapple area from 7,5m² - 8,2m². Normally used by pulp and paper mills. Grapple with endless rotating and open or closed grapple sides.